Segments of your audience (a.k.a customer base) are just like segments of an orange, a whole divided into parts. In our world however, each segment is uniquely different and we can choose how to characterise them. Segmentation marketing identifies specific groups of an audience, to create targeted advertising just for them. Used in the right way, it can maximise the impact of campaigns, giving you more bang for your buck. Each group requires a different action if you want to retain them and being able to segment allows you to do this. In the past, segmentation had to be done manually. It meant having a marketer trawl through spreadsheets, crossing information between multiple files to find a target audience. It compromised their time spent on other tasks. It was long, mundane and often dreaded. And to top it all off, it had short-term relevance and was subject to error. Today, that doesn’t have to be the case - platforms exist that can automate segmenting, even for large audiences, in minutes. Not only can segments be exported onto other platforms, they also benefit from being constantly updated. This means, if you create a segment label for customers who bought from you last week, the pool of targeted customers is updated day by day so that the audience will be different in the first week of July, to the last. Meanwhile, you don’t have to update a single thing. Not only is it set and forget, you can also go beyond the basics, into micro-segment. Micro-segmentation is adding lots of tiny layers, say targeting those that bought a brown teddy bear, but filtering out those who bought a large brown teddy bear with a red dress on. The cherry on top is that the marketer from before still has their job, but now they can actually focus on the creative, enjoyable side. This smart way of segmenting is able to distinguish between purchases that are one off and those that may be recurring. So, whilst past software gave us funny anecdotes, they also gave customers little faith. It’s very easy to be the Amazon in the story if you simply send out follow-up emails of related items without considering their relevance. 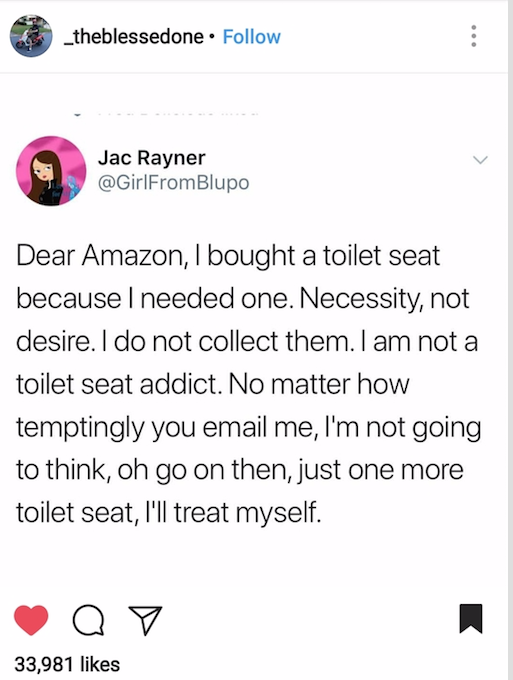 By acknowledging that toilet seat collectors are a rare breed, you can segment your audience based on purchases that are likely to be bought multiple times - like toilet roll perhaps. Don't be a victim to old styles of marketing or segmenting that are now deemed obsolete. Rather than creating static segments, or wasting time creating campaigns for customers who are unlikely to respond, smart segmentation is dynamic, responding to the changing habits and behaviours of your customers. As with just about any intel’ you collect from your customers, it is all about quality over quantity. You’re dealing with big data here but it should still be of high quality. High quality customer data creates high quality campaigns! Once you’ve taken all of that on board, you’re ready to start your own segmentation analysis and optimise your future marketing campaigns. *GDPR compliance is mandatory as of 25/5/2018 so make sure that you are following the new guidelines.